High School Sha! - SanGuoSha "Teachers VS Students"
The COMPLETE SanGuoSha "Final Pack"
SGS Reboot - Kingdom Wars! This post is long overdue, supposed to have been done when I wrote the update post on the Starter 2014 界限突破. Truth is, I got carried away with wanting to put up as much information I could find on this amazing invention but life happened and I put it away. Anyway, will be putting some more overdue updates on the game so enjoy! When is a cow or horse not an animal? This device is basically a transport tool that helps with transporting supplies to and from destinations. So you basically put stuff in it and move it along. But this is no ordinary transport vehicle, it has a special feature in that if enemies try to steal it, the Wooden Cow Transport will destroy all the items inside! Woah cool stuff yo. What's mine is mine and if not...its gone! p.s I think most of you would find it a bit strange that I differentiated the two ways of utilizing the card. But obviously there is a reason. Read on below. I scoured 桌游志 magazines and found this piece of writeup summarizing key guidelines that are understood from the game makers. 1) When you play this card, it belongs to the fifth spot in the equipment area. 3) If you do not place a card below it (during card playing phase), then you cannot send this card away. 4a) "Use" of the "supply" refers to normal card usage as per following the card's abilities. 4b) "Play" refers to when you need to play ATTACK or DODGE when Barbarians , Duel , Raining Arrows are being played. 5) The only person who can look at the supply card is whomever has the device and card in their area. 6) Supply can be used to fulfill requirements for cards and abilities, but only if its a definite requirement for the card. Its a little difficult to explain so an example is in order. You can use it for eg. Serpant Halberd ability or Zhuge Liang's Scient (看破）ability. You cannot use it for Xun You's (旬攸) Contrivance ability. 7b) When Wooden Cow Transport moves to other areas i.e the hand or to the discard pile, the supply will be moved to the discard pile directly. As most of you ardent fans would know, the update on the standard edition 2013 was not that big. There were amendments to Liu Bei (刘备)，Huang Yue Ying (黄月英) and Diao Chan (貂蝉) as well as 2 new faction-less heroes Yuan Shu (袁术) and Hua Xiong (华雄) and the rest was basically the same. However for the new 2014 edition, I'm happy to report it is quite a bit of awesomeness packed inside. For starters, I'm loathe to even call it the 2014 edition because it actually has a new name tagged to it. Its called 界限突破, which means 'Breaking Boundaries". I guess Yoka really put in some effort for this update. Get ready for this. Not 5, not 10, not 15, but a whopping 21 heroes are either amended or added for this update. The general idea is that quite a few of the Standard Edition heroes seem to be weaker as compared to the expansion packs, and that some are untouchables. Meaning they are dead weight with no practical use. So the idea is to make all heroes viable. See here for a list of heroes update. The expansion packs add on new cards like more armor, more weapons, more horses. This update introduced a new card. 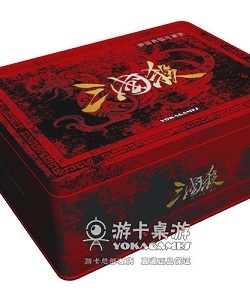 But not just any card, because it heralds a new category of cards, called 宝物 or "Treasure Cards"
Treasure cards are played just like an equipment. And there aren't any further rules on them...yet. But the significance of having a new category of cards means there are new mechanisms that the game will build on over time. 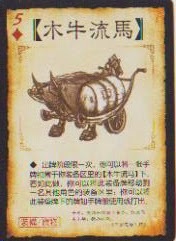 This new card is called 木牛流马, literally translated as "wooden cow, moving horse" and the card is interesting because it functions as a transport tool and you can "transport" cards to another player with this. Check this out for a more in-depth write-up on the ability. 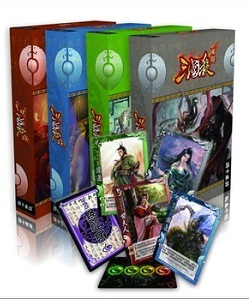 The original owner of the blog, Ricky, has moved on to his other commitments in family etc and I will be taking over this blog, as well as the e-shop at www.sino-games.com. I'd like to thank Ricky again on behalf of all the readers that has benefitted from his experience and effort to share the many stories that he has and to grow the community. We have plans to continue to grow the community and if you have any ideas/suggestions, we would like to hear them. As for those who have sent queries and/or posted orders, we seek your understanding as we sort out the logistics and get answers for you. I never got the hang of this! Despite it being brainlessly easy to learn, i never got my head around being comfortable on a skateboard! Maybe that explains why I was never really cool growing up! I got a lot of respect for kids who can do all sorts of insane tricks on a skateboard, simply because I know i can't do what they can do! In the era where ABBA dominated the radio and John Travolta was actually desirable, rollerskates were the bomb. Credits to whoever invented rollerskates, as it really did give millions around the world a fantastic new form of entertainment. In fact, it's probably not an exaggeration to say that a whole generation of children were born because their parents met each other having fun on skates.